Each minute, there are more than 2.3 million Google searches made. Internet users go to search engines to find any business they need or to learn more about any topic that comes to mind. Your brand must work to make certain it appears at the top of any search results pages that pertain to it and what it does for the consumer. 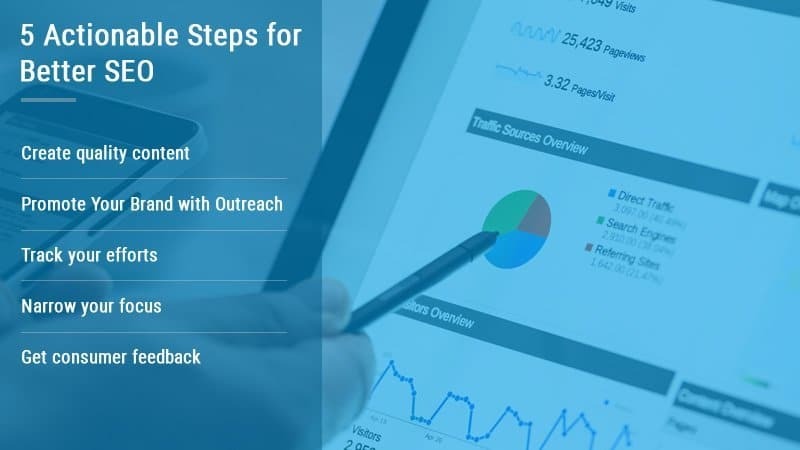 Take the actionable steps below to improve your SEO and get your business more online exposure and traffic. Although it may seem quite obvious that your brand needs to publish quality content to represent itself online, you would be shocked at how many ignore meeting this need. Poor grammar, typographical errors, and inaccurate information included on a website are sure ways to lose standing in your site’s search engine rankings. Be sure to not only create content that will give value to its audience and be of interest to it, but that also is error-free. Methods such as blogger outreach and resource page outreach will allow you to build links that direct web users back to your brand’s website. Having people click on a link that takes them to your website of course increases your site’s traffic. In addition to be a great way to get people back to your site quickly, link building has a tremendous impact on how well your website ranks. Building links can serve your brand well both by getting traffic to it and by showing search engines the other sites and pages that your brand’s own sites and pages are like. Your brand must utilize online tracking tools in order to know how its SEO is currently doing and how to improve it moving forward. With Google Analytics for example, you can see how many people are visiting each of your site’s pages, how long they stay on the page, what they click on, from where they access your website, etc. In gathering these metrics, your brand can see what is working for it online in how it reaches its consumers and gives them what they are wanting. Your content needs to be relevant and of interest to your target market, as well as be available on the channels through which your target market most often accesses its media. By creating web content specifically for your audience and putting it where they are likely to be, you increase the chances of your brand being found online and in the searches that are conducted on search engines. Reviews of your brand online give it the valuable exposure that it needs to perform well. The more that people are talking about your brand, the more it is seen online, and the better it will rank with search engine sites. Encourage your consumers to leave feedback for you on review sites like Foursquare and Yelp by offering incentives such as product discounts or a free service. Better SEO for your brand means better engagement with its consumers and better chances of gaining new ones. Help its SEO by crafting the perfect online presence that will make your brand visible in search engine results pages and the relevant and valuable information source that is wanted and needed by its audience.